The mobile game maker is about to turn a profit, and that has investors optimistic. 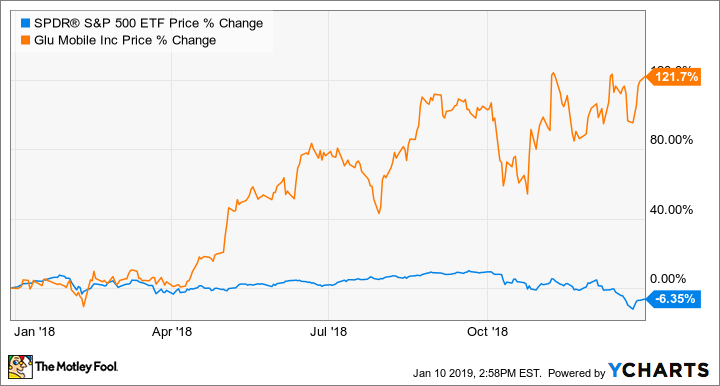 Glu Mobile (NASDAQ:GLUU) had a remarkable comeback in 2018. Management's strategy to move away from celebrity-focused mobile games to "growth" titles paid off in a big way, as the mobile game maker is on the verge of turning a profit for the first time in three years. For the first three quarters of 2018, the company's revenue grew 31% year over year to $270.9 million, driven by strong performance from three "growth" titles that span different genres: Design Home, Tap Sports Baseball, and Covet Fashion. What's even better is that the net loss narrowed from $58 million in 2017 to just $11.9 million in 2018, which puts profitability within reach. Investors have noticed the improvement, sending the shares up 121.7% in 2018, according to data provided by S&P Global Market Intelligence. That's a massive outperformance, compared with a loss of 6.35% for the S&P 500 index. Our strong top line marks our seventh consecutive quarter of reporting improved year over year bookings growth. This accomplishment reflects our decision to pivot away from celebrity titles and focus our resources on growth games that can grow bookings year over year while generating sustainable profitability and free cash flow. Analysts expect Glu Mobile to report adjusted earnings per share of $0.26 for 2018. That's a significant jump over the year-ago loss of $0.28 per share. Investors are excited because management has put in place a strategy that can sustain growth and profitability. Wall Street expects the company to grow adjusted EPS again in 2019 to reach $0.35, representing an improvement of 34.6% year over year. Analysts have high expectations because of a deep pipeline of titles the company is working on. In 2019, the company is launching WWE: Universe, Diner Dash Town, and a title under license from Walt Disney's Pixar. The company's Covet Fashion has already benefited from the popularity of Disney content. It's clear that Glu Mobile has turned a corner and looks well positioned to capitalize on the exploding growth of the $70 billion mobile game industry.